The small-to-medium business (SMB) “market” actually represents a very diverse, fragmented collection of businesses—from solopreneurs running home-based lifestyle businesses, to mom-and-pop shops, to fast-growth startups, to midmarket firms who’ve been in business 30-plus years—as well many more permutations and combinations. While all sorts of segmentation nuances must be considered, technology vendors most often use employee size as a high-level proxy to define SMBs. Size is a key criterion because it correlates strongly with IT resources (Figure 1). For instance, while 86% of medium businesses (100-999 employees) have full-time, dedicated IT staff, only 19% of small businesses (1-99) have these resources. In fact, external contractors are the primary means of IT support for about one-quarter of SMBs, and some—mostly very small businesses with fewer than 20 employees—have no IT support. SMBs are also less likely to have formal IT evaluation and budgeting processes than their larger counterparts. Business process expertise—whether in data analysis or marketing—also maps closely to business size. Employees in smaller companies tend to wear lots of hats, and few are specialists or subject-matter experts. As businesses get larger, they start to hire full-time marketing, sales, financial or other types of professionals. In fact, as cloud computing becomes mainstream, alleviating many IT shortfalls, the level of business process expertise becomes even more important. After all, cloud computing can make it easy to deploy a technology solution, but without business process expertise, its difficult to get business value from any solution. As a result, SMBs of different sizes and shapes often require very different marketing, sales, solutions and services from vendors. 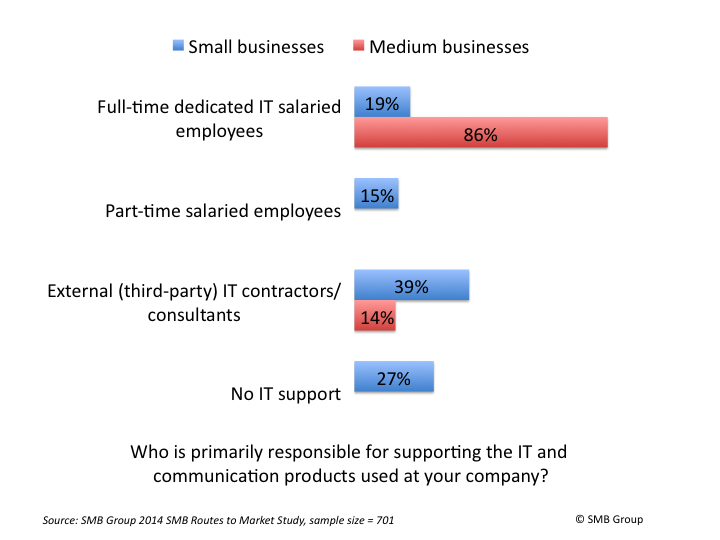 However, there is little consensus among technology vendors as to about what constitutes an SMB, even in terms of something as measurable as employee size (Figure 2). This means that SMB decision-makers need to determine vendors’ definitions upfront. If a vendor’s “mental map” of SMB conforms to the way you view your own business, then you’re much more likely to find a good fit. If not, you may end up wasting a lot of time researching and evaluating something that was intended for another target “SMB” audience. Learn the Top 10 SMB Technology Trends for 2019.